It's so easy to set up your mailing list. We'll make you an instant expert! To properly address your envelopes, we must have your address list in a spreadsheet: We prefer Excel, but if you don't have it, not to worry. You may also use a free alternative. Google Sheets or Apple Numbers are all popular choices. You may also try Zoho which is a free online spreadsheet. 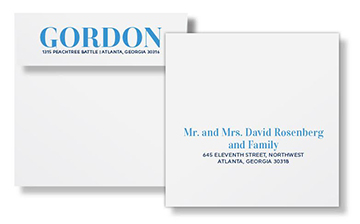 Please start working on your address list as soon as possible, as we only begin printing your invitation when all items, including the addressed envelopes, are approved to print. Important: your addresses print EXACTLY as entered. If you want the address to read "New York" don't send a list where the addresses say NY. If you prefer, you may place the title (Mr. and Mrs.) in a separate column. Same with city, state and zip. We show one column, but it is fine to use separate columns. Never mix data in a column. In the example below, the information in each column is not consistent. If you enter a suite number in Column D, it should never appear in Column C for some of the addresses. Or, if the city is always listed in Column E, it should never appear in Column F. In other words, if a column is used for the address on one line, it must be used for the address on all subsequent lines. No mixing data! Do not use more than 25 to 30 characters per line. This is all the room we have on your envelope. There is a limit of 5 lines for any printed address. That doesn’t mean that you are limited to five columns of data, just that they will end up printing on no more than five lines on your mail piece. We include one round of edits for envelope addressing on the house. Be sure to proof carefully! If you need to make edits, we will email you back a spreadsheet to work from. It looks like your original list, but we may have completed substantial reformatting to work with our addressing software, so be sure to use this new version. Your pricing includes addressing from ONE spreadsheet list. If you send your list in more than one spreadsheet, add $25 for each list after the first. Example: you have two lists: one with friends and family and one with your child's friends. There would be an additional $25 charge for the second list. As an option, you may combine them and send us one list to save this charge. Be sure that the data in each column is consistent after combining the lists. Please note our envelope printing is only available for items which are part of our invitation suites. We regret we are unable to offer envelope printing for other orders, including printing on your own envelopes.